A range of two bedroom serviced apartments at the Old Bus Depot in Kingsway, Lancaster. 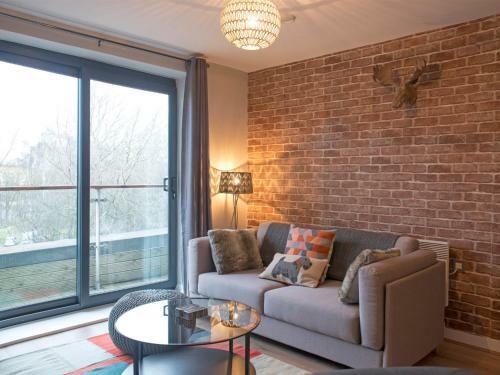 This Grade II listed building has been extensively refurbished and added to in recent years to create a striking residential development with attractive period features like exposed brick work. Each of the highly-rated and popular self catering apartments has a fully equipped fitted kitchen, comfortable lounge area and well designed decor throughout. Each one has a sofa bed in addition to two bedrooms and can sleep up to six people - some apartments have a balcony too. This is a spacious and comfortable self catering apartment in the Old Bus Depot development in the Kingsway area of Lancaster. Sun Street Studios are bright, vibrant self catering apartments in a Grade II listed Victorian property in beautiful Lancaster. Lancaster serviced apartments and holiday flats. Find self catering accommodation in Lancaster for business or leisure stays including the fabulous Bridge Square Apartments in a former bus depot. Lancaster Castle, also known as John O'Gaunt's Castle, is a fascinating 12th century castle which was formally used as a prison between 1955 and 2011. It's open to visitors with an adult ticket price of £8. 54 acre park, home to a cafe, woodland and the Ashton Memorial. Shopping mall in the centre of Lancaster with stores including GAME, HMV, Boots, Ryman, Argos and Costa. Stay in the Las Vegas of the North!